Village Gallery is a non-profit educational art gallery in operation since 1963. Reception: Sunday, June 10, 2:00-4:00 pm. Free Event. Join us for refreshments and meet our Featured Artists. 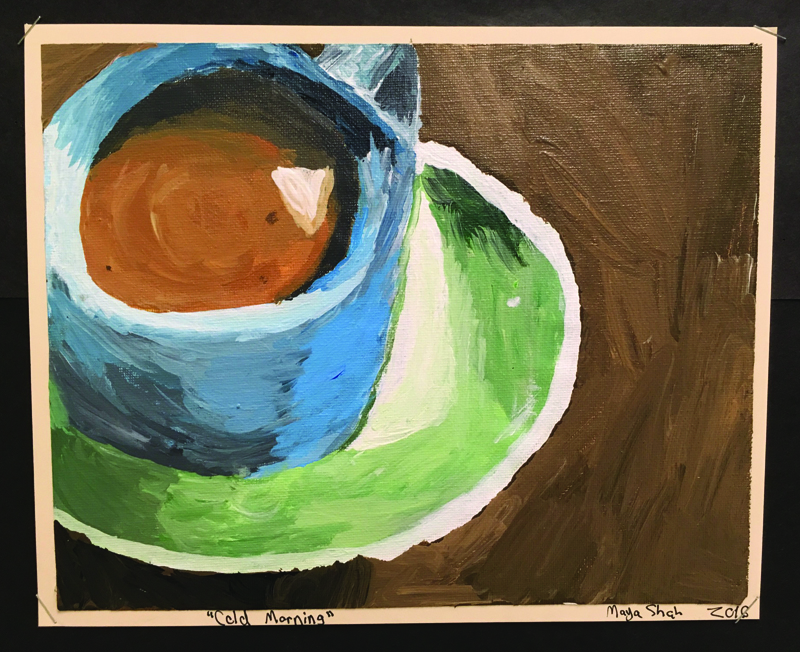 Over 65 students will be participating in the Village Gallery of Arts June show by either creating flags that will be flown outside of the gallery or with artwork exhibited for sale on the featured artist wall inside the gallery. The students have been working since March on this project and are excited to show their work. This collaboration is part of the gallery’s plan to support local art and as an outreach to the community. This show also acts as a fundraiser to raise money for art supplies for the school. We hope you will stop by and view this original and unique art. Lori McLaughlin, our Featured Crafter, will be showing her Clay Raku Glazed Garden Art. Stop by Beaverton City Hall to see the continuing exhibit by 20+ Village Gallery artists. Artwork will be displayed on the first, fourth and fifth floors. The show runs through June 28. Come join an exciting class learning a variety of art. I will be developing your child’s art ability where they are at and giving them an opportunity to try out different mediums so they can find what they will enjoy. We will be doing units in drawing, watercolor, acrylic, pastels, clay and mixed media. I am teaching fine art concepts and techniques with each lesson. We will be exploring a variety of subjects including landscapes, people, face, animals, cartooning and perspective. This is a weekly class and you need to register a month ahead in order to hold your spot for that month. Print your own unique papers and then collage with them in this two-day workshop. Brooke’s scientific approach to color tackles the Munsell chart and color wheel systems, examines how the human eye perceives color, and breaks down the behavior of light. Students can expect discussions and demonstrations on understanding the interactions and harmonies within specific pigments, choosing paint brands and hues, identifying temperature relationships, asking correct questions to match a premixed color, and achieving both vibrant and subtle variations with simple palettes. We’ll begin at the relaxed light-heartedness of the farmers market on Saturday morning at Cedar Mill Farmers Market. You’ll spend an hour taking in the atmosphere, music, smells, scenes, and people, and choose a colorful vegetable, fruit, or flower to paint. Back in the Gallery, we’ll go over how to lay out your palette, choose brushes and use lighting and value in your painting. Then you’ll paint, with hands-on, personal instruction. Life is not happening to you, you are creating it! Focus on the life you want, and don’t expect the things you don’t want. This is the Law of Attraction, and envisioning a positive life for yourself is the first step in manifesting the life you wish to lead. In this workshop, we will spend one hour in simple writing exercises to uncover and prioritize our life goals and desires. We will then create a visual roadmap of our dreams using images instead of words. Participants will take home a poster-sized vision board that can be used in a daily practice of training the mind to be more positive and open to believing and receiving our desires. Rebecca Benoit—Cell Phonography: from So-So to So Fabulous! Sunday, June 24,1:00-4:00 pm This class will explore tools in your camera that you probably didn’t even know it had such as adjusting focus, exposure, burst mode, white balance and using HDR. We will also cover fundamentals necessary to create juicy photos such as composition, exposure, focus and lighting and how to use the tools in your phone to make the most of these variables. We’ll also play with some fun accessories such as magnetic wide angle, macro and telephoto lenses. Join me for a 2-week class to practice basic watercolor techniques along with some fun ways to add interest to your work creating different textures. You may be surprised how many household items can help you work outside the paint and paper box! At the end of the class, you will have several reference sheets and completed greeting cards using your new skills. This is a great opportunity to try your hand at watercolor or just relax and enjoy a couple of summer afternoons with fellow artists. Join Madison for a very special weekend course with structured, easy-to-follow lessons. In this course, you will learn the art of creating a Traditional Buddhist Ritual Mandala. Create your own Mandala using paint and mixed media, and participate in guided relaxing and centering meditation and journal writing. You will learn about each ring of the Mandala and its meaning as you are guided through story and color until you reach the gates and find your own expression through art and writing. Join me for a six-week class to learn basic watercolor techniques as we practice painting different elements: flowers, skies, rocks/mountains, water, etc. We will experiment with different styles of each element using value contrast, color theory and principles of composition.